The Willerby Avonmore Delux has arrived at Smytham Holiday Park, a unique limited edition version of the Avonmore. It comes with many added extras to create a real home from home experience. The exterior has striking grey aluminium cladding and graphite UPVC windows which will set your home apart from other holiday homes. The inside is decorated in creams with finishing touches of duck egg blue which is featured in the curtains, scatter cushions, headboards and bedding. The lounge is both spacious and light with the front opening patio doors allowing direct access to the outside. This home lends itself to a fabulous sun deck to make the most of the countryside views. The modern feature fireplace includes a flame effect fire, large mirror and plenty of space to display your ornaments and books. The free standing furniture in this Avonmore make this home extra special. With a comfy sofa and two arm chairs with matching scatter cushions, you have the freedom to move the furniture around to suit your own lifestyle needs. The fully fitted kitchen comes complete with an integrated microwave and 70/30 fridge freezer. You can enjoy dinner with guests at the free standing dining table with upholstered chairs. Additional features include Bluetooth MP3 sound system plus USB sockets to the lounge and all bedrooms. This home comes with a choice of beautiful plots. 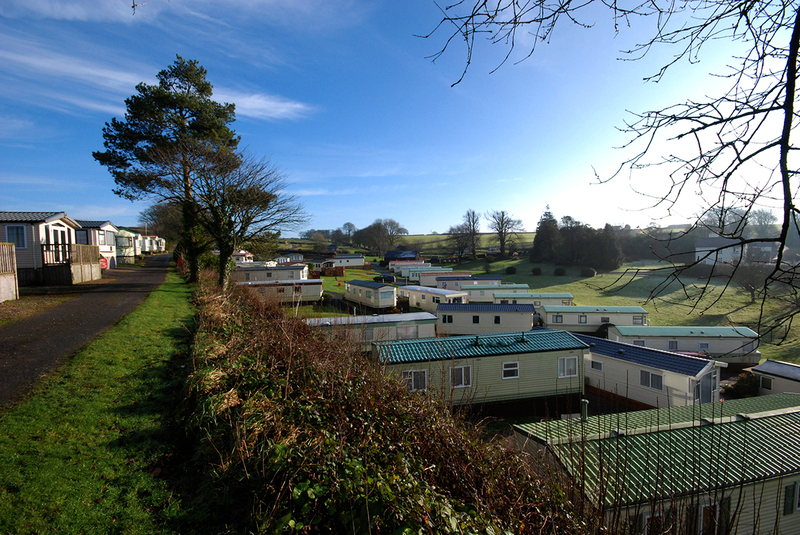 Smytham Holiday Park is a family-run park located in a countryside location in North Devon. It is just 2 miles from Great Torrington on the A386 Okehampton Road. Characteristic of North Devon holiday parks, you will find yourself at one with nature as you stroll through the woodland areas and the landscaped grounds. The park itself is set in 33 acres and is contained in its own valley. Smytham is dedicated to conservation and has won various David Bellamy awards, so you will be sure to see lots of wildlife around the park. You can look forward to enjoying an array of wild flowers, the bug hotel and the woodland ponds. The park has direct access to the Tarka Trail. Just follow the woodland walk and you will find yourself on the Coast to Coast route which stretches from Ilfracombe to Plymouth. Smytham is perfectly located with easy access to some of the most beautiful parts of the South West, with the three National Parks, Dartmoor, Exmoor and Bodmin being just a stone’s throw away. Dartmoor can be reached within just 30 minutes. There is also a wide selection of outstanding beaches to choose from, including Croyde, Saunton, Clovelly, Bude and Westwood Ho, which is just 20 minutes away in the car. All in all, this is a paradise for those who love the outdoors and are looking for peace and tranquillity for their luxury holiday caravan. Tourists looking for holiday parks in North Devon with ample wildlife, woodlands and trails right on their doorstep need look no further than Smytham Holiday Park.